Using a nasal saline rinse can help to thin and decrease the amount of mucus you produce in your nose, and stop it draining into the back of your throat. It also helps to rinse away allergens and irritants that make your nose itchy and make you sneeze. If you're using a nasal saline rinse, use it before you use any nasal steroid medicines, such as Alanase or Beconase (beclometasone dipropionate); Butacort or Eltair (budesonide); or Flixonase or Clearnase (fluticasone propionate). For adults, several nasal rinse devices are available, such as Sinus Rinse and Neti Pot. You can use these with commercial rinses such as NeilMed sinus rinse packets, or you can make your own saline rinse. To make your own rinse, dissolve ½ teaspoon of salt and ¼ teaspoon of baking soda in 250 ml of warm distilled or boiled water. Don't use tap water as it can cause bacterial infections. Use the solution in your sinus rinse bottle or pot. Manufacturers recommend that you replace the bottle or pot every three months. Children can use nasal drops or spray such as NasaDrops or NasaMist. Put the saline rinse in your bottle or pot and follow the manufacturer's instructions for your device. Or use the following instructions. Draw the saline rinse solution up into the bulb. Tilt your head downward over a sink (or in the shower) and turn your head to the left. Squeeze the solution gently into the top nostril. Breathe normally through your mouth. In a few seconds, the solution should come out through your other nostril. Turn your head and repeat the process on the other side. Adjust your head position as you need to, so the solution doesn't go down the back of your throat or into your ears. 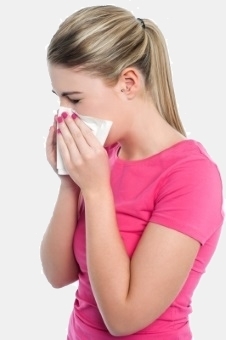 Blow your nose very gently to prevent the solution from going into your ear and causing discomfort. Stop using the rinse if it causes pain, a nosebleed or any other problem. After using the rinse, you can keep using your prescribed nasal medicines as normal. They may even work better than before!